You've seen the movie. You know the story. A heartbroken, Hollywood "Toon" star is accused of murdering one of the most popular men in town. The same man who was, just 24 hours earlier, seen playing "pattycake" with our star's lovely and mysterious wife. It's an open and shut case, right? WRONG! This is where your job begins. You must search high and low through downtown Los Angeles, the City Park, the Warehouse District and even ToonTown looking for clues to help Eddie prove that Roger is innocent. You have to unearth all four pages of Marvin's missing Will that will guarantee ToonTown's future forever. At the same time, you must also keep the Weasels from getting Roger, protect Jessica from the dreaded Dipmobile and help Eddie stay out of jail. As if that's not enough, you must collect the right weapons, accessories and facts that will enable you to defeat Judge Doom in the final confrontation. You'll have to call up all of your game playing and super-sleuth detective abilities to get you through this one... And there's still no guarantee. In the end, the joke could be on you. --From the NES Who Framed Roger Rabbit? instruction manual. 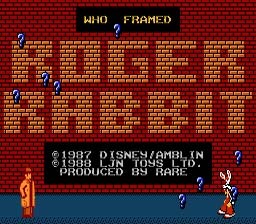 Play Who Framed Roger Rabbit? Now! Based on the Disney movie, you are Eddie Valiant. With Roger Rabbit as your faithful companion, defeat Judge Doom and save Toon Town. This is actually a surprisingly fun and complex game. It is basically a quest game, meaning that your fundamental task is to go around talking to people and finding different items to proceed through the game. It also has some action and fighting aspects, too. As you explore L.A. and Toon Town watch out for the Weasels. Choose the correct Punchline to keep them laughing. Use various items to tempt the different characters into giving you information or other useful stuff. At the password screen enter all 9's to start the game with 2 each of most of the game's items.